Transporting meals for tray service at your nursing home or healthcare facility is simple with this Alluserv VL2024S Value Line series stainless steel 24 tray meal delivery cart! 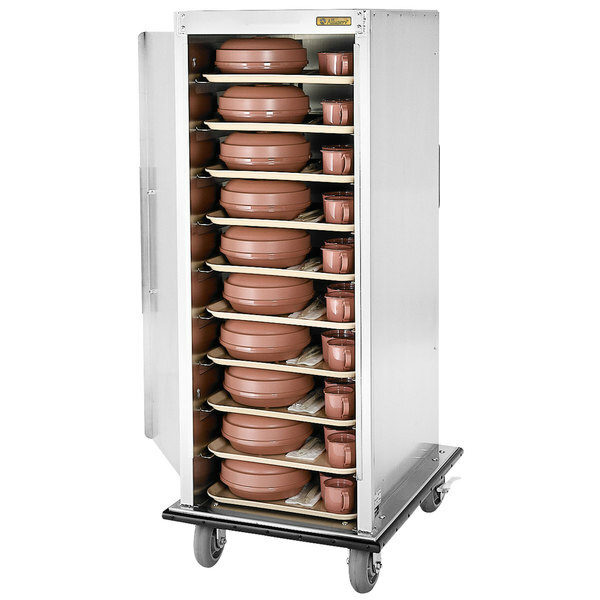 Featuring fixed tray slides set 5" apart, this cart has the ability to hold up to (24) 15" x 20" trays full of plated meals. Plus, its full perimeter bumper, vertical push handles, and (4) 6" casters, 2 with brakes, allow it to be easily maneuvered through your business without damaging walls or furniture. With an 18 gauge stainless steel body, 16 gauge door, and 14 gauge base, this meal delivery cart is sure to be a long-lasting, essential part of your tray service routine. In addition, it has a door that opens 270 degrees and stays open with magnets for easy access during serving. Then, when it's time to move it to another location, simply secure the heavy-duty gravity latch to keep the door securely closed during transport.